Every year, when we do trade shows, we always meet some newbies, people who are just starting out and looking for advice. Often, they’re swimming in a sea of possible equipment and supplies and mystified about what they need and what could be useful. For those starting out, or for those who are looking to get their shop equipped with the basics, we present this embroidery starter kit list. This list details the items we think a well stocked shop should have. For the purposes of this list, I will provide the name of the product and a brief description of the reason we believe it’s an essential item. The aim of the list is to help those who are stocking their shops get the basic items they need to do almost any embroidery job. Thread – We sell Iris UltraBrite Polyester Machine Embroidery Thread and recommend stocking at least your core colors in large cones. Your core colors are the colors you use regularly, the ones you replace most often. For most shops that’s generally between ten to twenty colors. Stabilizer – Yes, a shop can get by with just one type of backing, a lot of shops do that successfully. We recommend, however, taking advantage of the specialty backing options that are available. Here’s what, in our opinion, a well stocked shop should have when it comes to stabilizer. Cutaway – A medium weight cutaway will get you through almost any situation when cutaway backing is required. Medium weight, when it comes to stabilizer is generally considered to be 2.5 ounces. Tearaway – Two types of tearaway will generally appear in a well stocked shop. One would be a light weight tearaway suitable for use with shirts. The other would be heavy weight tearaway that can be used with hats. Poly Mesh – Yes, this is a lightweight cutaway, but it’s designed to be used with lighter weight fabrics and to hold a lot of stitches. 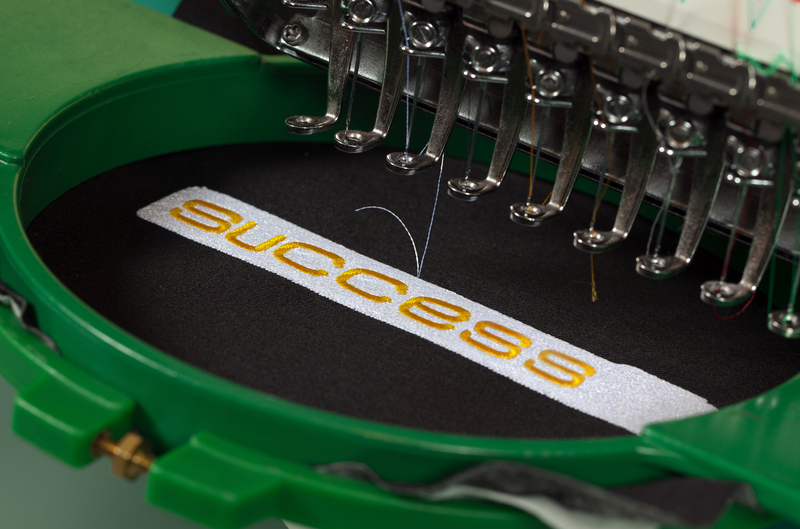 It can greatly improve the appearance of embroidery on flimsier fabrics. Adhesive Backing – A must for the times when you want to embroider items that are hard to hoop. Can also be useful to hold stretchy or slippery fabrics in place. Adhesive on one side topped with release paper. Water Soluble – This is a topping, but a must have if you’re embroidering anything with a pile like towels or fleece blankets. Used to stop stitches from sinking into the fabric. Bobbins – For commercial embroidery machines bobbins generally come in L or M sizes. Paper sided and MagnaGlide magnetic bobbins are two popular types. Some people prefer magnetic bobbins because they say they hold tension better. When purchasing bobbins, don’t forget you’ll also need bobbin cases. Plain works with magnetic bobbins, a no backlash spring bobbin case is often great with paper sided bobbins. Needles – Needles come in sizes from 65/9 (smallest) to 90/14 (largest). Many people use a medium size needle, a 75/11, for most jobs. Keep in mind that needles also come in sharp and ballpoint options. Sharps are for thicker fabrics. Ballpoints are great for fabrics which are more delicate and which have fibers that could tear easily. Accessories – There are a ton of accessories out there that can be purchased, but these are the ones that we think every shop should have. Seam Ripper – Yes, at some point you will need one. For ripping out stitches gone wrong. Cleaning/Lint Brush – You’re doing your daily machine maintenance, right? Machine oil – Really, you’re keeping the machine cleaned and lubricated, right? The main thing to remember, when stocking your shop, is that there are a lot of options out there. Trial and error might be required to find out what options work best for you. Don’t be afraid to ask for samples or advice. We’re always happy to help.